With the score at 23 – 5 at half time Dale were in control of the game and deservedly so. Luctonians came out in the second half and battled their way back into the match closing the gap and giving the home side supporters a few jitters. Dale, unlike in their previous two matches, managed to hold on to the lead and ran out worthy winners at 32-22. Luctonians scored four tries so went home with a point. It would have been two but for a last kick from Wharfedale’s Tom Barrett which meant they did not get the losing bonus point. As it was they outscored Dale by four tries to two. Tom Barrett’s boot, with three drop goals, two conversions and three penalties, brought his personal tally to 22 points. He might have been the Star Man but for the excellent work of Phil Woodhead and George Hedgley around the park. George Hedgley got the nod in the Rugby Paper not just for his own work during the afternoon but to represent the immense work done by the pack. The highlight of their work was in the line out. They restricted Luctonians to winning a mere 50% of their own ball whilst only squandering two line outs themselves; the second was not straight. Josh Burridge, Richard Rhodes, Tom Whyte and Hedgley were outstanding; not forgetting the accuracy from Dan Stockdale and Jordon Poole or the support work from the rest of the pack. The massive effort by the forwards in the last phase of the game kept the visitors deep in their own territory and led to the penalty which denied Luctonians the extra bonus point. They carried the ball for phase after phase; keeping possession and denying Luctonians a chance to break out. It was a truly magnificent effort, especially when they had started the second half being pushed backwards. It was good to see the half backs, especially Tom Barrett, in command of the situation and organizing the forwards and exhorting them to more and more effort. The ball became as precious to the forwards as if it were the crown jewels. Dale were given territorial advantage from the kick off when Luctonians could only clear to just outside their 22. Hedgley rose for the ball and the pack drove on and set up Tom Barrett for his first drop goal. Dale took the restart and exited well but were pinged on half way after a good chase. Dale easily won the line out and again exited well but again the follow up only led to another Luctonian penalty. 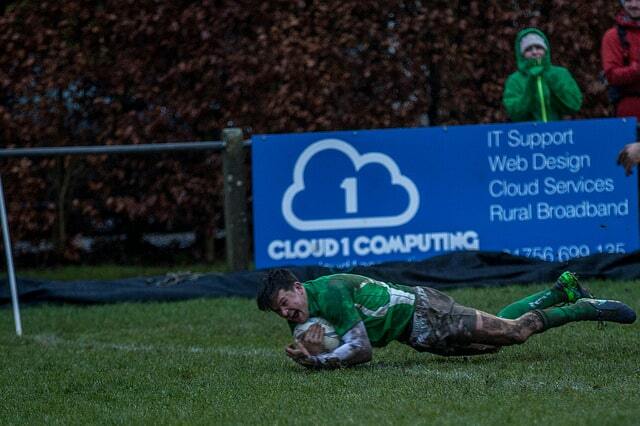 The Greens again won the line out and exited well making the visitors attack from deep. All they could do was to force a line out on Dale’s 22. Tom Whyte secured the ball and again the exit was carried out. A box kick from Phil Woodhead was followed up by Robbie Davidson and when the massed ranks arrived a mistake was forced. This was such a relief from previous games when the exit was poor and territory and possession too easily given away. Minutes later Barrett had a kick to touch from Dale’s 10 metre line. With his boot working sweetly he sent the ball deep into Luctonian’s 22. The pressure eventually told when the pack, from another clean line out drove the Midlanders back and Burridge crashed over for the try. Barrett stroked the two points. Dale did give away possession from a line out just after the restart but soon won the ball back and Jamie Guy sent a towering kick deep into the Luctonian’s 22. Great follow up work from Harry Bullough, Scott Jordan and Tom Davidson earned Dale another attacking line out. This time Dale were penalized for transferring the ball, after Tom Whyte’s clean take, without making contact. Dale were soon on the attack again and an audacious dummy from Phil Woodhead gave him the space to race into the visitor’s 22. Unfortunately, he could not find his support and decided to chip ahead but the ball just ran dead. Luctonian’s then had their best period of the first half, which eventually saw Louis Silver scoring wide to the right. He was helped by three incidents that could have stopped them. The first a clear forward pass in their own 22; secondly a kick from Tom Davidson, after he had stolen the ball, which looked amazing but seemed to have a life of its own and roll on and on to go dead and the third was the clever work, not seen by the officials, in holding back Harry Bullough who could have reached the try scorer. As it was the officials saw nothing and awarded the try to Louis Silver. Barrett kept the scoreboard ticking over with his kicking before a Tom Whyte turnover lead to another touch kick from Barrett. Burridge secured the line out and the backs were let loose. Clever work from the back line with Tom Davidson used on a dummy run and Scott Jordan appearing in the centre gave space for Harry Bullough to round his man and reach the line. Luctonians opened the second half with two tries. The first a penalty try which was converted by John Morris; the second by Alex Smith after 28 phases in Dale’s 22. A catch and drive led to Luctonians bonus point try with Joseph White being awarded the score. Barrett’s accuracy from the tee and out of hand however kept Dale ahead and gained Wharfedale a valuable victory. All players contributed to a good afternoon for the Green Machine. Adam Howard, Toms Asejevs and Joe Altham worked tirelessly both with the ball and in the tackle. What a difference an accomplished exit strategy makes. Instead of defending in our own 22 we forced Luctonian’s to attack from deep and we won the territorial battle. Barrett had a colossal game and could have easily been named as Man of the Match but, as I said earlier, Hedgley got it on behalf of the forwards. Barrett’s kicking was a major factor in the game, as was the control that he and Woody showed at half back. Apologies for mentioning the errors that led to Luctonian’s first score. I would not have mentioned them but I was moved to when the Luctonian’s coach was calling us cheats (very loudly) at the end of the game! As well as the early incidents there was a desperate attempt to get a scrum, near the end of the game, instead of the Dale pick and go by shouting “Head, head” when Adam Howard was lying down with cramp!! I enjoy banter but feel that someone from the Luctonians set up should have shut him up. A pity as otherwise this had been a game played in a good spirit and there was respect for each set of players and good comradery between the supporters. Good to see a goodly number making the trip from Luctonia and enjoy their first visit to the Avenue. We were complimented on more than one occasion on the hospitality. Finally, a tradition was started (at least I hope it becomes one) with a very successful Ladies’ lunch. Immense congratulations to Amanda Spencer for setting this up and all the ladies for making the day such a success – even your scribe nearly had his nails done! Wharfedale – Harry Bullough; Robbie Davidson, Tom Davidson, Jamie Guy, Scott Jordan (Josh Prell 72); Tom Barrett, Phil Woodhead; Joe Altham, Dan Stockdale (Tom Whyte 41, Dan Stockdale 69), Toms Asejevs (James Huck 65), Adam Howard (Ian Larkin 77), Richard Rhodes, George Hedgley, Tom Whyte (Jordon Poole 40), Josh Burridge (c). Replacement not used Jimmy Bullough.